Smile Makeover Solutions for a Beautiful Smile! It’s never too late! Imagine being able to turn the clock back 20, 30, 40 years or more to look younger and healthier with a more beautiful and attractive smile even if your smile has been damaged by decay, trauma, and advanced wear. Full-mouth reconstruction also known as full-mouth restoration or rehabilitation is a series of procedures that is designed to fully rebuild and restore your teeth, bite, and muscles in both the lower and upper jaws simultaneously to achieve comfortable, fully functional, and undeniably attractive smile. 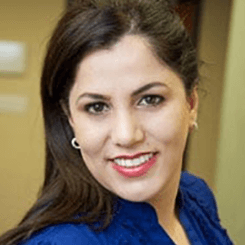 Dr. Maryam Horiyat, your top cosmetic dentist in Mission Viejo, and our team of board-certified periodontists and dental implant specialists are a professional and highly-skilled team that patients trust for exceptional full-mouth reconstruction and oral surgery in Orange County, CA. If you think you need full- mouth reconstruction, schedule an appointment with Dr. Horiyat for a smile evaluation and individualized treatment plan. Please call (949) 364-9600 or of Mission Viejo today for an appointment. What Is the Reason of Full-Mouth Reconstruction? The mouth is incredibly complex; the hard tissues like teeth and bones, soft tissues, and temporomandibular joints must be in harmony to function properly. When any part of this complex system begins to break down, it ultimately affects all other parts. The good news is that with a proper treatment plan, our dentist, Dr. Horiyat, will always reestablish harmony and give you back a healthy, long-lasting, and youthful smile. Who Is Qualified for Full-Mouth Construction? What Are the Benefits of Full-Mouth Reconstruction? The first and foremost benefit of full mouth reconstruction is that a customized treatment plan can resolve severe dental issues, which is extremely important for your overall health and well-being. 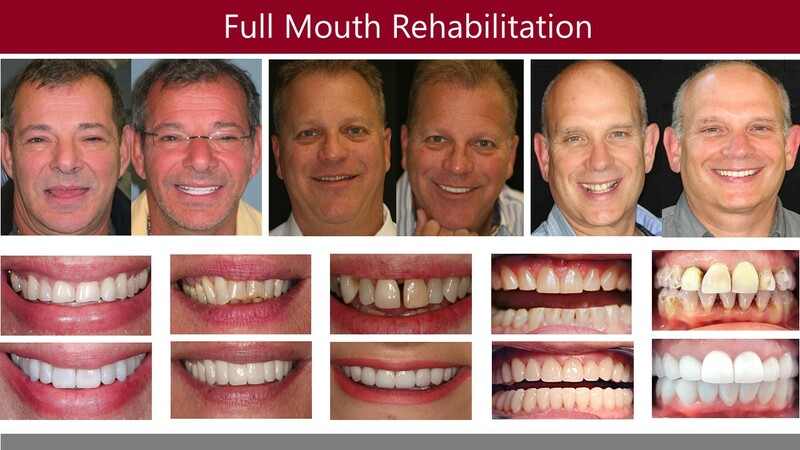 Full-mouth reconstruction procedure is an amazing improvement in your oral health, functionality, and aesthetics. In terms of function, the restorative dental work such as implants, crowns, and bridges can significantly improve your ability to eat and drink. It can also allow to speak more comfortably. If needed orthodontics work, it can eliminate bite imbalances and help resolve TMJ issues. In terms of aesthetic, a full mouth reconstruction can dramatically enhance your appearance and self-esteem. Teeth that are chipped, worn down, or missing cause the jaws to “collapse” onto each other, making you look older. Investing in a full mouth reconstruction at Aria Dental can make your smile whiter, straighter, younger and healthier. It can be a life-altering treatment and make everyday life more enjoyable. Why Choose Aria Dental for Your Full-mouth Reconstruction? Dr. Maryam Horiyat is graduated from University of California, Los Angeles (UCLA) in 2001 and University of California, San Francisco in 2006 with a Doctor of Dental Surgery degree (DDS). She has extensive training and an ability to incorporate all the disciplines of dentistry - restorative, implants, orthodontics, and cosmetic to give you stunning and healthy smile in a relaxed environment. She also has thorough knowledge, experience, and skills in smile makeover for more than 12 years. She has transformed the smile of thousands of patients since 2006. Aria Dental is a unique private dental office that employs not only the top general & cosmetic Dentistry in Orange County, but also the best board-certified specialists such as periodontists, orthodontists, endodontists, anesthesiologists, and oral surgeons under one roof in an utmost private and relaxing setting. They will work closely with you throughout your entire treatment process. When you choose Aria Dental for your treatment, you can expect the finest experience. Aria Dental team are dedicated providing affordable, gentle, safe, modern, and the premium quality dentistry with 5-star customer service. You will be seen promptly by our team of doctors, because we value your time. 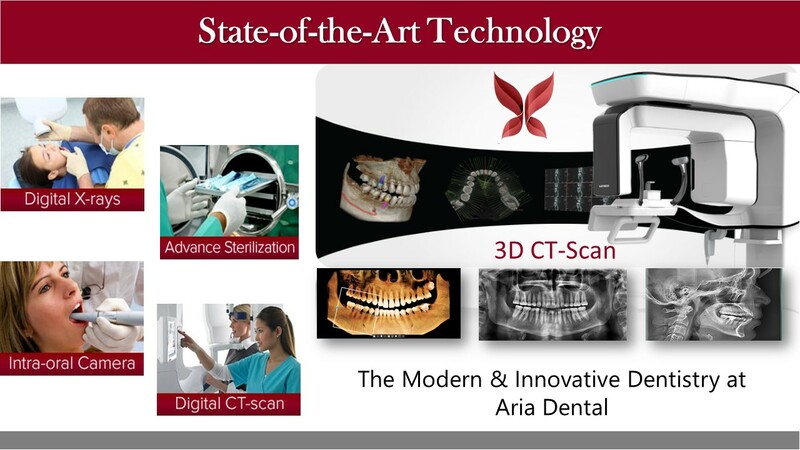 Aria Dental understands the importance of a solid relationship built though trust and integrity and committed to going above and beyond to satisfy your dental needs.